These 15 springtime activities belong on every spring bucket list! Here’s how to enjoy spring so you can shift into the slow lane and live intentionally in the season. I love every season, but spring is the most fun to watch. Every day there’s some new progression, some new accessory of leaf or flower, as all of creation responds to beckoning sunshine and warming winds. How can we stand not to answer this call, too? Spring is ephemeral; if we hesitate to embrace it, the world will turn beneath our feet and we’ll stumble into summer before we know it. Sure, we’re busy. This is the time of year we make a mad, overscheduled dash toward June, checking off school commitments and planning the calendar for the next season already. 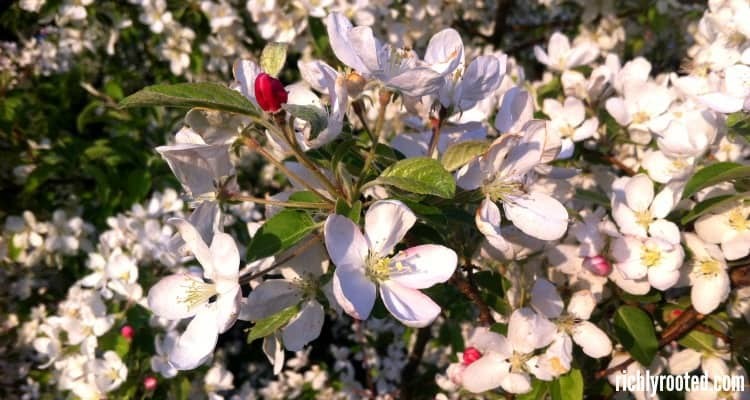 But it doesn’t take a massive, all-or-nothing commitment in order to enjoy spring. 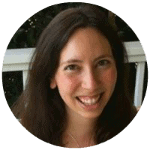 It just takes a reasonable measure of intentionality, of slowing down to savor each day–and maybe making a few larger efforts to enjoy a bucket list activity or two. If you want to savor springtime, start by noticing the small changes that happen every day in nature. Focus on doing outdoor activities that will be harder to enjoy when the temperature heats up. Freshen up your home–and yourself–and bloom where you’re planted! Make eating outdoors a regular habit for at least one daily meal…or all three, if temperatures permit! When you eat outside on your porch or lawn you might only be a few steps away from your normal dining table, yet the atmosphere of the meal changes entirely! I always feel tensions and frustrations melt away when I’m dining al fresco. If you don’t have “proper” patio furniture, do it anyway. Spread a blanket on the ground. Eat with your back against the front door. Just be outside! 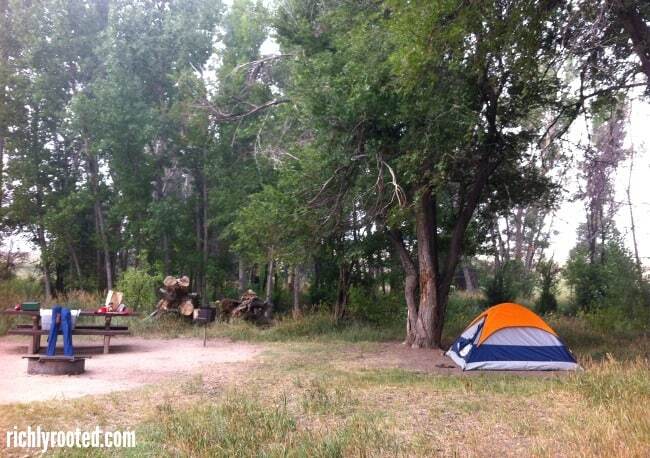 Spring can be the perfect time to tent camp, particularly if your part of the world gets uncomfortably hot in summer. I live in Alabama, so that’s definitely the case for me. Head somewhere nearby if you only have a weekend to spend, and enjoy the lengthening days. Here’s some ideas for what to eat on your camping trip, and here are five camping “tools” I always use! By eating seasonally, you’ll save money and enjoy fruits and vegetables that are tailor-made for spring! Think of fresh, delicate produce like lettuce, peas, artichokes, strawberries, and rhubarb. I made some printable spring produce guides by region, which you can find HERE. There may be more nearby than you think! We moved here two years ago, and I was happy to discover several parks by driving past them or via word of mouth. But when I recently Googled “parks near me” I was surprised to see many more locations come up that I wasn’t even aware of! Spring is a prime time for scoping out these places, so you have an arsenal of go-to spots for any circumstance. For instance, find a place you can go for a long walk, somewhere you can play when you need shade, a spot for a big family gathering, etc. Go to the library and get a few illustrated field guides so you can observe the birds, flowers, and trees in your area as they get more active. As I mentioned in my Charlotte Mason post, even babies and toddlers can learn to identify and enjoy their natural surroundings. I relish the decluttering bug that always seems to hit when the seasons shift. 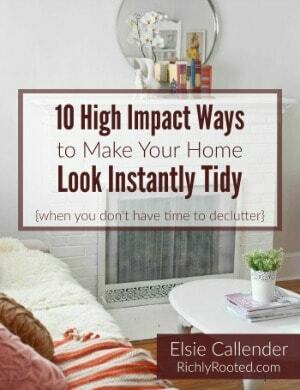 My decluttering handbook makes the whole process non-overwhelming, so you can enjoy a home that breathes! Many states have farmer’s markets that are open year round, but spring is definitely a good time to go, while the weather is nice. If you’re not a regular, don’t go with the expectation or stress that you have to hound out the best price. Instead, set aside a little budget that you can feel free to spend on whatever catches your fancy. Maybe it’s nesting instinct, but I am itching to deep clean our home this year! 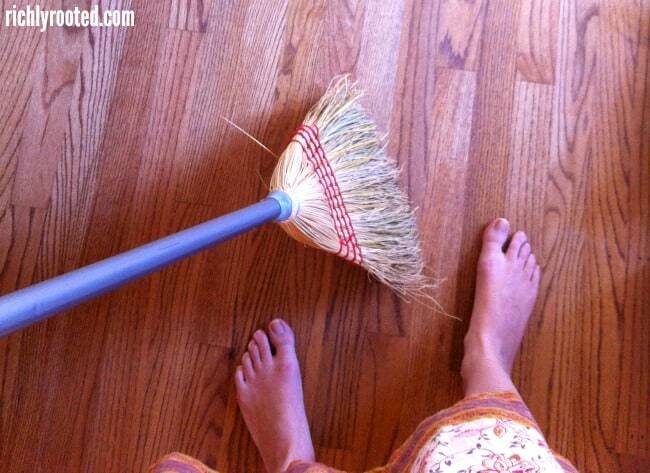 I have a deep spring cleaning game plan and checklist that I’ll use, plus my natural spring cleaning arsenal. 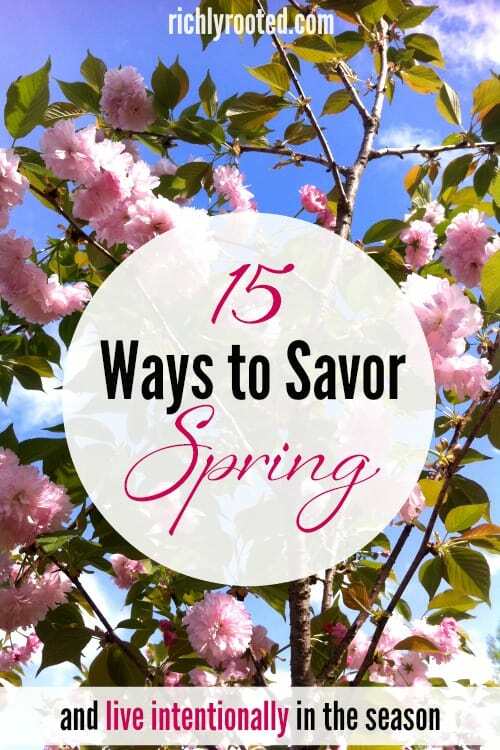 If the quickening weather of spring motivates you, capitalize on that! Throw open the windows, sip a smoothie, and enjoy sprucing up your haven! Give some attention to areas that won’t be as pleasant to work in once summer sets in. For instance, clear out your back yard or shed, or do an attic or garage project. Here’s yet another excuse to get outside: use a clothesline! You can shave money off your energy bill, and enjoy the scent and look of clothes on the line. Even if you are not a dedicated gardener, you’ll love the intentionality and participation of helping something grow. Earth Day is April 22, so that might be a fun time to schedule your planting. 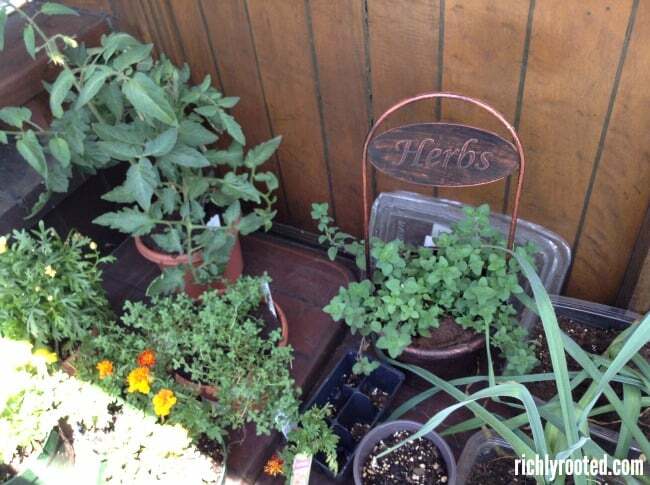 If you want to start small, try a balcony herb garden. Get to know your city better by walking it. Pick a few sites or parks that are within walking distance of each other, or just meander and see what you discover. You can also check your city’s website to see if there’s any festivals or art shows going on. What do you love doing in the spring? I wasn’t much of a gardener in my early 20s, but now that I own my own home I can’t wait to garden and landscape! My jobs are keeping me from doing much, but I’ve enjoyed planting a few roses I got on sale. I’m excited to see them grow! We have a monthly house budget which limits the pace we can plant things, too! But we got some camellias to beautify the front yard, and I’m working on rehabing our herbs for the back deck. Hopefully we can come visit you in your new home sometime(: And you come here, too, okay?